Commander Star-Esseenia is the Higher Self of Rev. August Alexandriah Stahr. As Quadrant Commander of the Star-Esseenia Division of the Ashtar Command and the daughter of Commander Ashtar and Lady Athena she works closely with the four other Ashtar Command Divisions serving under Commander Ashtar of the Ashtar Command now known as the Solar Star Command. Commander Star-Esseenia and the Star-Esseenia Division creates and manages the Star Team Programs that Rev. Alexandriah channels to FREE her clients and by extension all of Humanity from the MATRIX. All Karma Clearing - MATRIX Clearing Technology Rev. Alexandriah Stahr offers her clients come from the Star-Esseenia Division of the Ashtar Command. 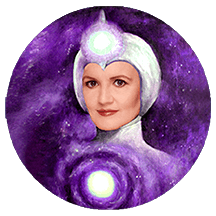 As the main research scientist within the Star-Esseenia Division, Alexandriah has access to all of the Star-Esseenia Division's Healing and Spiritual Development Technologies which she then offers to her clients to Free them from the limitations of the MATRIX.